September 29th is the feast of Michaelmas. If you're like me, you're thinking, "What? The feast of what? Who? What's this? Why are there dragons?" My friend Haley came to my rescue and did an interview, walking me through the pronunciation, background, and some ways to celebrate the feast. Haley was a delight and I hope you enjoy the video! There's links below you'll want to check out too - follow up on some of the things we discussed during our conversation. Haley's blog, Carrots for Michaelmas. Haley said Embertide and I had no idea what she was talking about. This is what she was talking about. Roasted chicken, not from Haley but it'll do until your cookbook arrives in the mail. Whiskey glazed carrots from the Pioneer Woman. Blackberry cobbler, also from the Pioneer Woman. Blackberry compote for the cake. +St. Michael the Archangel, defend us in battle. Be our protection against the wickedness and snares of the devil. May God rebuke him, we humbly pray, and do thou, O Prince of the Heavenly Hosts, cast into hell satan and all the evil spirits who prowl about the world seeking the ruin of souls. 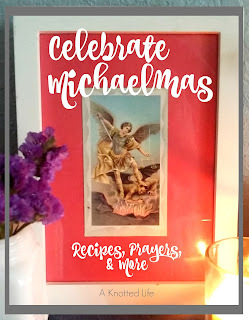 So raise your hand if you're going to make whiskey glazed carrots and a roasted chicken this Monday, and finish dinner with (Arch)Angle Food Cake with a blackberry compote and the prayer to St. Michael. If you're new here, stick around! You can follow A Knotted Life on Bloglovin' or Feedly. Be sure to subscribe to my YouTube channel so you never miss a Knot Bad Video. too! This is awesome! You guys crack me up! Also, if I haven't had this baby yet, I'm totally making that awesome sounding Dinner! Thanks for doing this interview, I really enjoyed it! I love this!!! We are going to start with this celebration this coming year. It's been so overwhelming thinking about celebrating the feast days but this made it seem do-able. Thanks!!!! Loved this video! You both were great! I'm excited to celebrate our first Michaelmas! :) and I think the boys will enjoy it too! Thanks for all the kind words, ladies! Haley is so wonderful, so laid back - a delight! So are you, Bonnie! Two beautiful women sharing some fun and feast that helps our faith come to life! Raising my hand, except instead of the chicken, I'm going with angel hair pasta. It's my son's name day and he likes noodles. But yes to everything else! This was so great, thank you! I love this! Helpful every year!